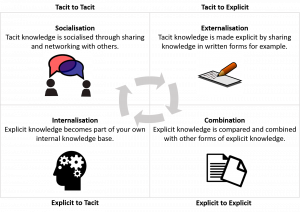 Nonaka and Takeuchi (1995) developed the knowledge creation cycle to distinguish between tacit and explicit knowledge. The knowledge you have but cannot express, and you may not even know you have it. It is often procedural; focussing upon how things get done. Have you ever tried to explain, giving directions and found that although you are familiar with the route, you cannot explain how to get there? That is because much of your know-how has developed almost automatically and non-verbally, it is ‘tacit’. The knowledge you can easily share, and you can write it down or tell people about it. The following diagram shows how tacit and explicit knowledge evolves. 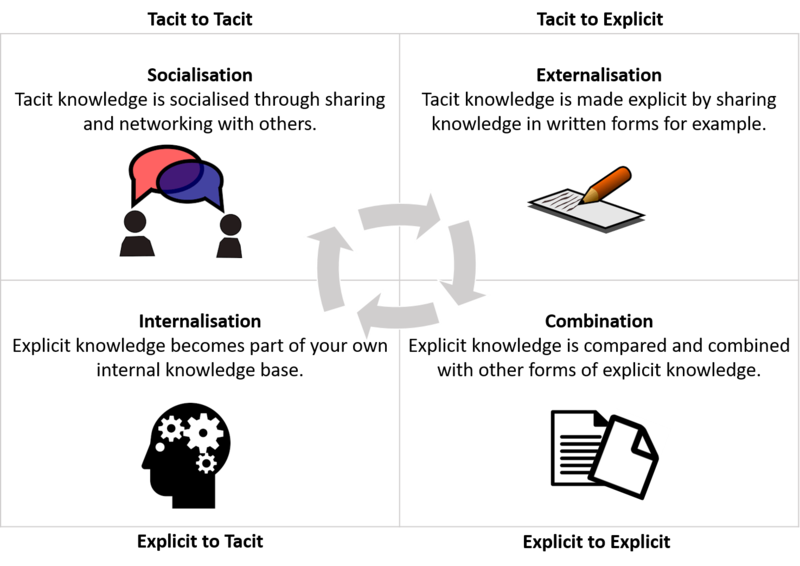 The inner arrow circle describes the processes you might engage in as knowledge evolves. teasing out our tacit knowledge and that of others to build new understandings. When did you last make your tacit knowledge explicit? Was it understood by the other party? If so, how did you achieve this? If not, what could you do better next time to develop the other party’s understanding?